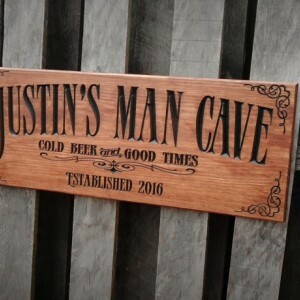 Man cave and bar signs are great fathers day, birthday or Christmas gifts for the man in your life. Each one is made to last a lifetime from high quality solid Pine. It has a classic vintage look that looks great with any decor. 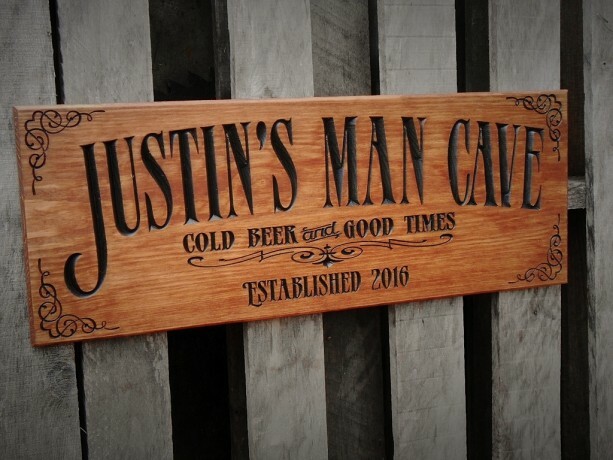 The letters on this sign are deeply carved into the sign blank giving it a rich custom look that can't be duplicated by paint, vinyl or even laser engraving. By working full time in my wood shop I can offer fast turnaround times on custom orders. Custom sign orders usually ship with in a week of placing the order. Production times can vary due to workload so you may want to contact me for turnaround time if you need it in short order. ****SPECIFICATIONS**** Size is 9 x 24 Comes with 2 sawtooth hangers on back. Rounded edges for a soft clean look. Deeply carved letters Solid Pine For indoor use only. Make sure you provide the following: 1. The name exactly as you want it to appear. 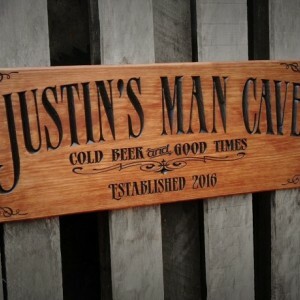 Justin's Man Cave, Justin's Bar, Justin's place or whatever you want. If you list only a name, your sign will have that name and nothing else. 2. Slogan you would like in second line ( Cold beer and good times) 3. The est. date ****CUSTOM ORDERS**** Don't see what your looking for? 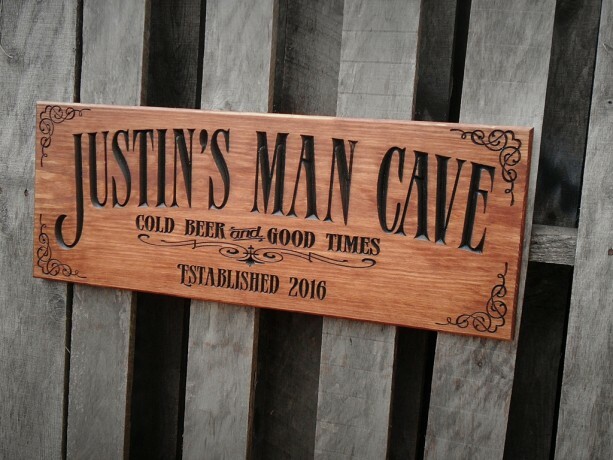 Contact me with your request and we will work together to create your perfect sign. The possibilities are endless.